In the ranks of the generation of American violinists born between 1915 and 1935 � Yehudi Menuhin, Ruggiero Ricci, Oscar Shumsky, Sidney Harth, Berl Senofsky, Aaron Rosand and Joseph Silverstein most prominent amongst them � the name of David Nadien burns perhaps less brightly. That this should be so is a measure of the difficulty of sustaining a top flight solo career and also of the nature and extent of Nadien�s musical life and is assuredly not a reflection of his innate violinistic talent � which places him toward the apex of the American born violinists who followed hard on the heels of Albert Spalding�s death in 1953. Nadien was born in New York in 1928 and studied with Adolpho Betti, celebrated first violinist of the Flonzaley Quartet, and later with the pedagogue Ivan Galamian. Principally a recitalist he did also appear as soloist with the New York Philharmonic, of which orchestra he was leader from 1966 to 1970. He has been a distinguished teacher and coach and also had a substantial commercial career in the studios of New York, appearing with other stellar first-call session men such as violinists Harry Lookofsky and Charles Libove as well as the late cellist Alan Schulman (broadminded listeners will find Nadien on many an unlikely disc and he was part of the string section on Spyro Gyra�s jazz-fusion albums for example). Cembal d�amour�s Mordecai Shehori has an exceptionally high regard for Nadien�s playing � this is Volume 2 in the series - and it�s one I share. Live performances and reissues from a now rare Kapp LP comprise the recital and it is one of captivating interest. Firstly Nadien is a tonalist of alluring brilliance. His sound is bewitching throughout the scale, orientated toward broadly romantic lines, with an intense vibrato that vests everything he plays with individuality and charismatic propulsion. In the Kreisler Variations his husky tone is put to good use as he takes the quick central passages much quicker than, say, his colleague Oscar Shumsky � more quicksilver and less patrician perhaps than the older player. His rubati are deliciously exploratory and the sound ear titillating in the extreme with luscious intensifications of the solo line through expressive pointing. His playing is intensely vibrant, communicative and alive. His Veracini � this is an Old School recital such as Elman may have given � is another deeply expressive and profoundly romanticised reading. Some may find his intensity overwhelming, rather in the way William Primrose frowned on violinists� indiscriminate use of continuous vibrato � but there�s no doubting the fervour of the playing and nor is there in Kreisler�s Recitative and Scherzo which finds Nadien in richly ecstatic form. His articulation in the Paganini-Kreisler is clear. He keeps tonal vibrance even in the highest positions whilst one can appreciate the variety and strengths of bow pressure in the Schubert as well as the sheer lyrical elasticity of his phrasing and the variety of vibrato usage employed. The Dvoř�k is enlivened by subtle increments of volume and paragraphal sophistication whereas one can bask in the sultriness of his Ravel and the way Nadien meets the technical challenges of Wieniawski�s Scherzo-tarantelle. He dispatches the Wieniawski with panache, enlivening the slower variational passages with succulent intensity. The acoustic for Schön Rosmarin is rather bold and hard � Town Hall, New York and among the most recent of the pieces recorded � but the playing is still communicative even if not quite up to his gold standard. The disc actually starts with two pieces with orchestra taken from an enthusiastically received concert in Budapest given in 1973. 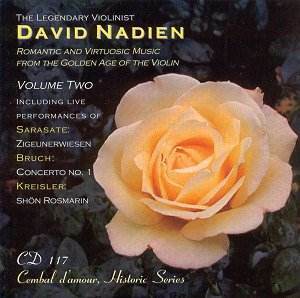 In the Sarasate, in a rather clotted acoustic and with a bumpy edit at 3.17, Nadien is certainly not afraid to coarsen his tone sometimes in the interests of variety and inherent drama. The Bruch Concerto meanwhile receives the same kind of acoustic but this is swashbuckling playing, immensely cogent, dramatic and theatrical, alive to phraseology with veritable plateaux of soft and loud playing. I wouldn�t call either accompaniment or recording subtle but one is certainly swept up in the maelstrom. Nadien spices his line with gorgeous expressive devices and he surmounts the occasionally galloping accompaniment with fervour and aplomb. There�s more than enough here to keep violin fanciers happy. Individuality and tonal riches such as Nadien possesses come but rarely and should be celebrated when they do. Heir to the Great Tradition, indeed, he is a musician of delicacy and intimacy as well as panache and drive: an all-round musician and consummate violinist in fact.